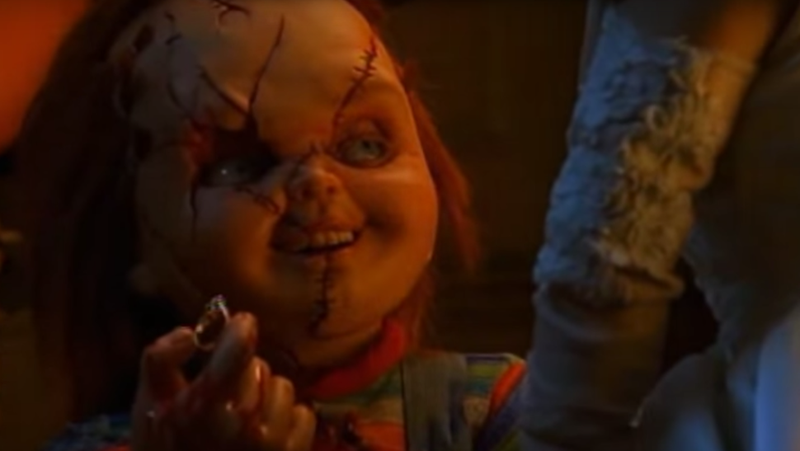 Which Horror Movie Villain Would You Want to Propose to You? The internet has shown us many a strange marriage proposal. Some lackluster, some weird and some, straight up frightening. A Los Angeles couple’s Back to the Future-themed engagement photo has recently gone viral, but their unique marriage story actually started at the proposal. Last year, Alec Wells dressed up like Michael Myers, the serial killer character from Halloween, to propose to his horror movie-loving girlfriend, Katherine Canipe. The magic moment took place on the same street where a scene from the movie had been filmed, EW reports. A proposal that comes straight from your dreams: you’re relaxing in a nice, warm bath after a long day. Suddenly, Freddy Krueger’s glove slowly rises from the water, holding that ol’ familiar blue box from Tiffany & Co! This would all go down during an impromptu camping weekend at Crystal Lake. You wake up in the cabin to sound of a machete chopping...something. Fresh veggies! Jason’s making brunch for your very special day. You’d have to solve an extremely elaborate puzzle before you even GET to the big question! The engagement ring would be presented in the Lament Configuration box, obviously. And there would be SO much leather in the wedding party! Next comes planning for the big event. First up, get the twins from The Shining as flower girls. Congratulations! Images via Universal Pictures, Warner Bros. Television, New Line Cinema, Paramount, Lionsgate, Dimension Films, New World Pictures.